Amy, the public library Director, and her friend, Sunny, are thrown into a missing person’s investigation in Past Due for Murder. Lacey, a college student, is missing presumed lost in the woods outside of Taylorsford, Virginia. Does her mysterious trek into the mountains have anything to do with the fairy lights or the legendary hidden treasure? Mona, a local Professor and folklorist, is trying to determine the truth about the lights when she too disappears. Since the police suspect Amy’s boyfriend Richard, Amy steps in to clear his name. Another great entry in the Blue Ridge Library Mystery series. 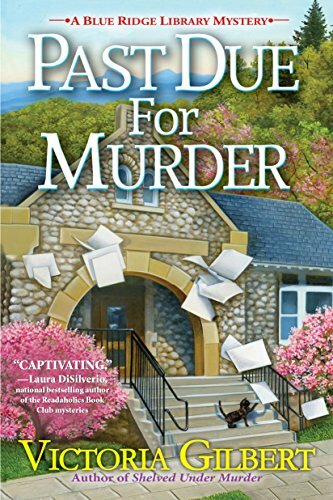 Past Due for Murder can also be read as a standalone. The characters in this book are the stars. All have their own internal motivations and needs. Their actions make sense in the context of the plot. The mystery is just puzzling enough to keep the reader guessing until the end. This book is highly recommended for cozy readers. 4 stars!